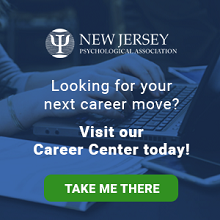 Disclaimer: Inclusion of a psychologist on the NJPA Speakers Bureau or the NJPA Media Resource List should not be interpreted as an endorsement by NJPA. In no event shall NJPA be liable for damages to any user of this public relations service for the voluntary selection of a psychologist, for the resources provided by any psychologist listed herein, or for any other damages associated with this NJPA Speakers Bureau or the NJPA Media Resource List. Please note that the choice of a psychologist is entirely yours and there are numerous psychologists outside this resource service who are qualified to address your particular needs. NJPA members are a valuable source for reporters and others seeking expert advice in all areas relating to mental health and mind/body issues. Through our Public Education Committee (PEC), our members serve to educate the public about the value of psychological health and how psychologists help people’s health, lives, businesses, and families. Members are available to the public for speaking engagements and to respond to reporter inquiries. Below are a variety of contributions our members have made in the media. Check out our Speakers Bureau page to locate an expert that may fulfill your needs. We also have an extensive list of psychologists who respond to media queries. Please contact Christine at [email protected] or 973-243-9800 for outreach to our psychologists.